Happy Monday! Although in completely honesty, this particular Monday feels more like a Mondaze. Team TME enjoyed Mother’s Day with our respective families and for those on the East Coast (USA) you know how extraordinarily gorgeous the weather was yesterday, so we’re finding it a built difficult to get our heads back into the game today. We’d much rather be lounging outside … wouldn’t you? Understandably, no one wants a yellow smile. First and foremost is good oral healthcare. Brush and floss after each meal, see your dentist regularly and for an on-the-go dental quickie we’re loving the Rolly Brush Mini Toothbrush. Moving on … let’s get to some natural teeth brightening tips! Baking Soda and Lemon – This is probably one of the most well known natural teeth whitening solutions. And in fact, baking soda itself was once use as “toothpaste” to brush teeth. But, the mixture of baking soda and lemon juice works rather effectively to brighten teeth. As with anything, don’t over do it. Use this solution once a week as to avoid possible irritations. Oil Pulling – Sounds gross right off doesn’t it? It’s not, and oil pulling has been around forever. Basically, oil pulling is rinsing your mouth and teeth with natural oil. Take one tablespoon of organic oil like, coconut or sesame, which you probably have in your kitchen, and swish it around in your mouth for 15-20 minutes. Thoroughly rinse your mouth out with water. 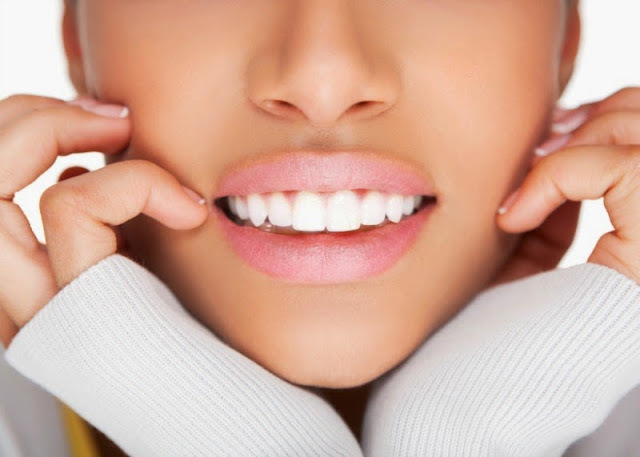 Food Grade Hydrogen Peroxide – Food-grade hydrogen peroxide (FGHP) can be an effective teeth-whitening remedy. Mix a 50/50 solution using FGHP and water, and swish it around for 60 seconds. Eat Strawberries - Strawberries can help whiten teeth because they naturally contain an enzyme called malic acid (a chemical found in teeth whitening products) and vitamin C. The astringent found in strawberries helps to remove surface stains, while vitamin C washes away plaque. Along with eating yummy strawberries, mashing up a few and brushing with the mixture once or twice a week can have positive results. Eat Crunchy Fruits and Veggies - Apples, celery, and carrots are all great for your teeth. Crunchy fruit or vegetables act like nature’s toothbrush and they’re also super healthy snacks. Check out a super quick snack recipe for apple sandwiches! Last, but not least. Use a Straw - Coffee, tea, and soda … those fab drinks that keep us going throughout the day…all cause stains on our teeth. So whenever possible, use a straw to reduce direct contact with your pearly whites. *Medical Advice Disclaimer: The information included in this article is not intended nor implied to be a substitute for professional medical advice. The reader should always consult his or her healthcare provider.